Two apartments, 23 years and 4000 miles apart, my journey the thread that connects them. 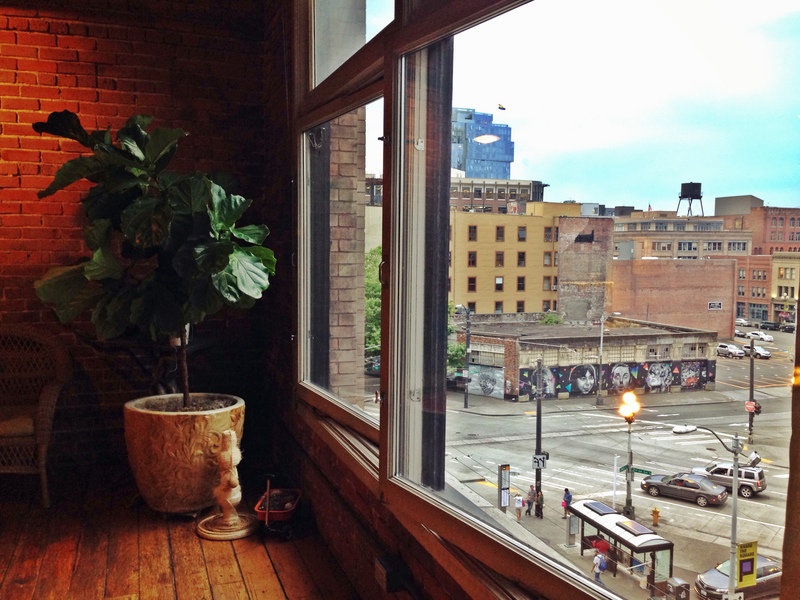 I look around my new home, my first owned home in the US – a beautiful 1900 sq foot space warm in the glow of old wood floors, red brick and reassuringly strong beams, tucked away in a converted paper mill in one of Seattle’s oldest neighborhoods. Jazz floats in through the windows, probably from the corner bar. I feel grateful to be here. And thankful to myself and my pillars (Amee and Mariya) for making it into this movie scene except it’s not a movie and I’m not acting. It’s as real as the decades of consistent effort it’s taken to get here. My mind wanders to a little girl, my younger self. When I first entered our new, much humbler home, a tiny apartment awkwardly stacked on top of a busy bazaar with a greasy food-poisoning-guaranteed restaurant right below it, all I was saw was how small and cozy it would be. I didn’t compare it with the homes we’d grown up in, bungalows with manicured gardens lined with jasmine, servants and cars. I heard whispers that our lives were changing for the worse because Abu had died and we had no money, but I didn’t understand why that was such a bad thing. Nothing changed. We were still us, whether we lived in a mansion or a shack. My 13th birthday altered that perspective – more than a little bit. It was a mistake to invite my school friends over. The disdain in their faces, the wrinkled noses at the smell of re-fried food from the restaurant below, the averted gazes at school the next day, the quiet but unmistakable distance in the coming weeks and months, all indicated that my entire worth was summed up in where I lived. Except, here’s the thing – I come from a family of crazy people, optimistic and entirely self driven and self defined. I remember feeling no anger towards them but knowing that their understanding of the world and of others was superficial and uninformed. That little home gave me focus, helped me connect with what’s important (i.e. my own development) and who’s important (i.e. those that see you independent of your context). Among the art galleries, startups, venture capital offices and hip restaurants of Pioneer Square, there are two homeless shelters. My friends comment on that being a little scary. It probably is. But yesterday morning, as I got ready for work, I saw one of those homeless guys walk out of the shelter, dressed up in a collared shirt, walking towards downtown Seattle. On my drive over, I wondered if he was going for an interview. What kind of job would he get? Would that job be a stepping stone to something else? What did he aspire to achieve? Would he get there? Did he identify with himself as a homeless man? Did it bother him that that’s all other people saw? I read Maya Angelou’s poem when I got to work. It’s been my prayer since 1992 and it was my prayer for the man that lives in the homeless shelter. This entry was posted in Ramblings... and tagged identity, loft, pioneer square, self discovery by mona akmal. Bookmark the permalink. inspirational. sorry you had a tough time so young and were exposed to such shallow “values”, but i feel so proud to see you now. did your early bad experience help make you so strong, or did the inner strength you possessed then help you to rise above it all? congratulations on your lovely new home.